will be on show from 7th Feb. until 2nd March. please r.s.v.p on 021 423 5309, we look forward to seeing you there! As my art is not incomprehensible it is devoid of deep meaning and thus unsuitable for art-speak, but I will say this : I don’t know whether the words ” a dog is a man’s best friend” was originally spoken in jest , but I think it’s a profound statement. Uncomplicated companionship between people is a rarity, between a man/ woman / child and a dog it is common. The impact of this uncompromising loyalty on the universal human experience must be huge. I often (half) joke that when I moved to the country, I thought that I would meet lots of nice people – I didn’t realize I would meet so many nice dogs. David has a background in illustration and design, and has been a full time artist since 1999. Tania, born in Zimbabwe studied graphic design in Cape Town where she later apprenticed with Barbara Jackson in 1986 and has been exhibiting her work ever since. Annari van der Merwe is an artist who lives in Cape Town. Her paintings are figurative with a narrative undertone. Oil is her favourite medium and she usually works on canvas. To achieve certain effects she will, however, use mixed media, including charcoal or pencil for drawing and acrylics for underpainting. Her style is realistic, but her work cannot be described as realism as she has a penchant for composite images using diverse visual elements, sometimes giving her work an ironic or humorous, even surreal, twist. She tends to explore the same theme in series of paintings. Her work is characterised by fine detail, an interest in spatial phenomena and speaks of rigorous craftsmanship. She often uses her own photography as reference material. Annari grew up on a sheep farm in the Karoo. After matriculating in Cape Town, she spent a year in the USA as an exchange student. Subsequently she studied languages and literature at the universities of Port Elizabeth (now NMMU) and Rhodes and the Rijksuniversiteit Utrecht in the Netherlands. Her professional career in general publishing started as children’s book editor at Tafelberg. She is, however, perhaps better known as founding publisher of Kwela, an imprint of NB Publishers, and, later still, of Umuzi, now an imprint of Penguin Random House South Africa. She started painting in 2014, under the tutelage of Greg Kerr. The Old Masters, whose work she presents in surprising new contexts, also serve as inspiration to her. Emotion compassion meaning and beauty are pathways to experiencing nature. It is believed that feeling connected with nature is beneficial to wellbeing and pro-environmental behaviour. What binds these artists is their love of the natural world and their unique way of expressing this. Sophie Niemann is a British born artist who has lived in Africa for the past 20 years. In 1996 she moved to Botswana with a in BSc Zoology where she became a field guide, wild life researcher, worked for a conservation community organisation and finally set up her own field guide training academy. “‘Living in the Lowveldt I am faced with colour and light each day. 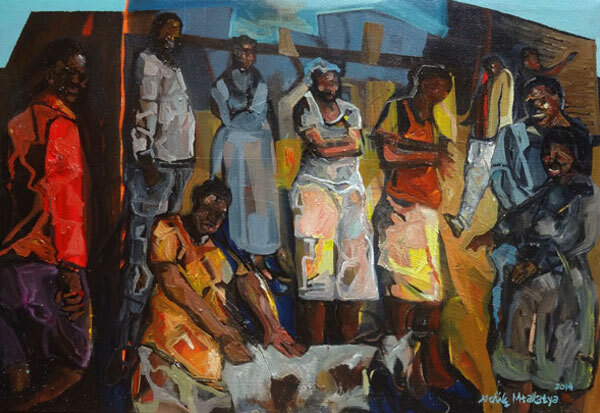 The rural settings and vibrant clothes weave their way into my work. People ease into these scenes. Nature, especially rock formations, mountains, clouds and trees are his inspiration. Hennie was born in 1949 in Bloemfontein in the Free State. Growing up on a farm, nature was life and life was nature. After studying at the University of the Free State he worked as a geologist for forty years. He is now a full-time artist. Who has not sat at the fireside with friends and swapped stories of encounters with animals in the wild. Surely this is one of the oldest past times in the history of mankind. Travelers come from distant places to South Africa re-ignite the flame, to engage in the primal hunt with their cameras, to experience the bushveld and have a story to tell. The preservation of wild places with their unique eco systems has become a challenge to the conservators today. In presenting images of wildlife the artist is often an advocate for the survival and maintenance of endangered species. Scenes and events experience on Safari are so vivid, so visceral that it requires of the artist enormous skill to convey them with impact and daring. Recognition for those who achieve this is forthcoming and generous. Noel Ashton, Lin Barrie, Heidi Burstein, Eugenia Campbell, Peter Diggery, Paul Dixon, Ant Fynn, Ann Gadd, Anthony Gadd, Peter Gray, David Hadaway, Margot Hattingh, Peter Höhsl, Barry Jackson, Robert Koch, Marinda Koch, Karin Kruger, David Kuijers, Mandy McKay, Adolfo McQue, Penny Meakin, Sophie Niemann, Nola Muller, Lisa Narramore, Makiwa Mutomba, Dino Paravano, Elizabeth Poulsom, Christopher Reid, Steve Shooter, Yvonne Sommeling, Frederike Stokhuyzen, Cobus van der Walt, Douw van Heerden, Gerbrand van Heerden, Ian van Zyl, Ron Waldeck. The annual Winter Solstice exhibition at The Cape Gallery is a time of reflection. Long dark nights subvert the rational light of day fostering desire and dreams. a time to let the imagination rove. superficially or with greater penetration – ‘below the surface’. Theo Vorster, Vuyile Voyiya . In May 2007, Mandy picked up a paintbrush for the first time. She joined the South African Society of Artists in 2008 and has since exhibited regularly in their annual exhibitions at Kirstenbosch. In 2010, 2012 and 2013 she qualified for SASAs Merit exhibition, winning a ‘commended’ award in 2013. Mandy exhibits annually at the Grahamstown National Arsts Festival. In rural South African culture a greeting is a formal recognition. It can begin before people meet, at a distance, and slowly evolve into an extended exchange of formalities that include an inquiry into the health, circumstances and wellbeing of the other person as well as that of their relatives and other members of their community. Finally, when two people meet, the handshake is courteous and takes time. Only after these pleasantries does the business of the day come under discussion. South Africa is a vast country of contrasting landscapes. Migrants by choice or by the financial imperatives of urbanization, come to the city steeped in the traditions and rituals of their rural homes. These rituals embody and enact events that celebrate the great, slow, natural cycles of life through the medium of dance, chant and drumming. Meshack Tembani, Mandla Vanyaza, Voyiya Vuyile, Timothy Zantsi. Helen’s Solo exhibition will be opened by Leslie Charnock on Sunday, 3rd September 2017 at 4:30 p.m.
Van Stolk explores her intuitive response to abstraction within the figure and the landscape. She takes us on a sensory journey connecting us to the human form. “Picture books are what I read… I did as a child and still do as an adult. I feel and think through images, far more than with sound and words. So I guess it is not surprising that it is through art that I express myself. My work focuses on provoking a feeling, an emotion – be it in the figure or landscape. So much can be said with colour, line and shape. Colour, light, my surroundings and thoughts play themselves out onto the canvas. My intuitive use of gold has led me to Kinsugi, the Japanese art of repairing broken pottery with gold. It embraces the flawed or imperfect, making it beautiful for just that. It carries connotations of fully existing in the moment amid changing conditions. A physical expression of the spirit. Think of the image of a bowl, completely open, yet contained. to reveal fragments of the unconscious mind, a fascinating collection of artworks.